Another Dead Oligarch » « Alternate Version: Psst! Wanna See What $3Bn Looks Like? As you probably recall, I am not a fan of Psychology. It too often relies on naming things and passing the name off as an explanation for the thing. It’s simple appellomancy [oglaf] – names have power. As we are constantly modeling other people’s motives and imagining what they may want to do, we are limited by our own experience and imagination, so we tend to imagine other people might do the things we’d do in their position. What would it look like if that thing you’re afraid of having happen, is actually happening? I’d probably be wealthier if I had made it more complicated, perhaps book-length. What I’m getting at is that “projection” is just a side effect of how we model other people’s behaviors, that “threat modeling” and “gut instinct” are inevitably tied to our own ideas and imaginations. That’s why, if someone is shouting loudly about there being a “problem with cannibals in the neighborhood!” the first place you should look for cannibals is in their basement. It’s pretty simple, really: they’re thinking about cannibalism a lot, apparently. This approach will not always work, of course, because a clever cannibal would not go around basically marketing cannibalism. The Republicans – especially the North Carolina Republicans – are suspiciously concerned with election-rigging. Granted, the Democrats also have a long history of voter suppression, but the midterm election generated a high level of Republican heat around allegations of busloads of voters, etc. It appears that the Republicans had been thinking hard about “how to rig an election” and had generated a few credible threat models: because they were doing them. Naturally, the Republicans are also howling for justice to be done. Because that’s what they planned to do if they caught Democrats cheating. Just kidding; sorry that wasn’t funny. This is what I mean when I say that the election systems need to be better designed, so that they cross-check themselves. The Republicans engaged in the simplest, most obvious vote fraud that they could come up with – and they probably did that because they thought they had political top-cover that would prevent it from becoming obvious. If Dowless starts talking about the cannibal threat in North Carolina, someone get a search warrant and check in his basement. It’s interesting that CNN doesn’t mention the “forged signatures” part of Dowless’ criminal record and only mentioned the insurance fraud. Why not, CNN? Dowless appears to have been paid $400,000+ by the Harris campaign. Damn! Computer security is a good career but apparently “felon political hack” pays a whole lot better. I know you have probably seen this already, but the vote for the US House was nearly evenly split (something like 48-51) but the Democrats got 3 seats and the Republicans got 10. This state is one of the biggest offenders with regard to gerrymandering. The republicans have no intention of allowing a fair race or representation proportional to the vote, and they will do everything they can to prevent it. At least the super-majority that they had in the state legislature was broken this election, but it should have been much more pronounced. 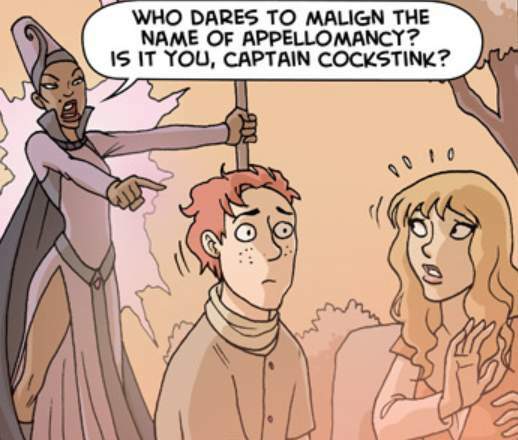 It’s simple appellomancy [oglaf] – names have power. I feel reassured by having learned that. As for ‘appellomancy’, it’s another part of othering. If we call Mexicans rapists and thieves and Muslims terrorists then in too many people’s minds that’s what they are. The truth gets lost because people are lazy and don’t ask questions or take the time to think for themselves. My grandmother used to say, “A thief sees nothing but thieves everywhere they look” and “Them that can’t trust, can’t be trusted”. Looks like she was right. It’s a good modification of psychological projection. Mine is something like “attributing negative characteristics to others that you are capable of yourself”. Take out the “negative” and there might be a deeper phenomena there. Mine is something like “attributing negative characteristics to others that you are capable of yourself”. Take out the “negative” and there might be a deeper phenomena there. That’s a good one, too; I think we’re capable of more than we usually pay attention to, which is why I tried to embed the idea that its what we’re thinking about. In a sense, when we are doing a threat assessment of someone else’s actions, we are doing a threat assessment of ourselves. Old age means surviving, grandmother usually means old age. I always listened to my grandmother pretty carefully. I would disagree, it can also mean being really sheltered or plain lucky. One of my two gramas still does not really think we germans did do really that bad when she was young. All those dashing boys and men in sharp uniforms. And it was really just not nice and really impolite of these americans and british to bomb us. I tend, somehow, not to take her advice. That’s why, if someone is shouting loudly about there being a “problem with cannibals in the neighborhood!” the first place you should look for cannibals is in their basement. It’s pretty simple, really: they’re thinking about cannibalism a lot, apparently. In my opinion, that’s not how it works. There can be many other reasons why somebody sees thieves everywhere they look. Maybe they are a victim who got robbed recently. Maybe their friend or family member is a victim. Maybe their professional career is related to preventing theft. Maybe they read too many novels about criminals. Maybe they just happen to be paranoid. My mother happens to be a person who sees thieves everywhere and never trusts people. Her problem? She has a specific personality that makes her more likely to be targeted by people with bad intentions. She has had her wallet stolen on multiple occasions. Several of her friends have betrayed her. Even her own sister abused her trust in a very nasty way. I have tried to have this talk with my mother several times about how her behaviour attracts the wrong kind of attention and how she turns herself into an attractive victim. She understands the problem, but she’s still unable to change her personality/behaviour. Thus she has come to the point where she believes that majority of humans are assholes. It also goes the other way—it’s not necessary for a thief to see thieves everywhere. Maybe a professional thief knows that among humans there are a few thieves and the rest of people are just clueless and gullible prey. I’m not denying that there are cases where a person being overly concerned with some behavior can be seen as a red flag indicated that they might be secretly engaging in this behavior. But this isn’t always the case. People are more complicated than that. The Republicans – especially the North Carolina Republicans – are suspiciously concerned with election-rigging. The way I see it, the Republicans are concerned with winning elections. Election rigging is just a method for it. Occasionally they can benefit from directly rigging the election. That’s when they do it. On other occasions, they can benefit from talking about elections being rigged (for example, when it allows them to pass voter ID laws that prevent people of color from voting). I don’t see this situation as one that requires some fancy psychological explanation. It’s just a basic case of people doing whatever the hell lets them achieve their goal. An axiom around higher education is the : “Psychology majors are crazy”. From experience I can say while perhaps not clinically true a lot of them are drawn into psych because of extant mental issues. People with major issues tend to think about mental health more frequently and this naturally tends to draw them to study the problem. It is said, and I have noticed in personal experience, that fat people tend to obsess about weight and this manifests frequently as their having a lot of diet books. This is so consistent that he argument that you can tell a persons weight by the number of diet books on their shelves is at least in part true. The single most paranoid person I have ever known about physical security, he was obsessed about locks and bars and keeping burglars at bay, was a thief. The irony wasn’t lost on anyone. I suspect all of this comes from our internal modeling. We kind of know something about ourselves, even as we frequently deny what we know. We are loath to admit that this internal knowledge applies to ourselves simply because we like to think of ourselves as special and unique and far more sophisticated than simplistic drives and motivations would indicate. Lacking any other pattern for the mental operations of others we use what we have, the ostensibly orphaned model of ourselves. Which is how we get a situation where public accusations against others are essentially confessions of their own crimes. The kicker is that the irony is entirely lost on them. Of course projection, as powerful and explanatory a concept as it is, has limits. Applied too quickly and carried too far you end up with: “He who smelt it dealt it”. A situation where you can’t cite any wrongdoing for fear you will be accused of the same crime. A friend of mine likes to say, “If IT guys wrote the DSM, psychologists would have ‘Can’t Shut Up About My Feelings’ disorder. In addition to fearing the misbehavior they’re likely engaged it, I think a lot of politicians fear-monger what would have to be true to pre-justify their actions. The single most paranoid person I have ever known about physical security, he was obsessed about locks and bars and keeping burglars at bay, was a thief. An anecdote cannot be seen as evidence. Or, more precisely, in this particular case, this anecdote could prove that “sometimes people who are obsessed about some negative behaviour actually engage in it.” However, from the wording in your comment, it seems for me like you were trying to argue that “usually people who are obsessed about some negative behaviour actually engage in it.” There’s a difference. An anecdote can prove that something can occasionally happen. It does not prove that it happens frequently or on a regular basis. I’m not sure about the relevancy of this example. This blog post started with an example where people choose to engage in some behaviour. A person chooses to commit election rigging, and the same person also chooses to publicly talk about election rigging. Same goes for a thief who chooses to steal and also chooses to install locks and bars at their home. It’s a whole different matter with medical problems. Someone with diabetes will obsess about sugar and insulin; somebody with a celiac disease will obsess about their food being gluten-free, somebody with a heart disease will obsess about cholesterol. When a person has some medical problem, thinking about it (or “obsessing” about it) is no longer a choice, it’s a necessity. Being obese has numerous health related drawbacks, thus people who have a problem with managing their weight are pretty much forced to “obsess” about losing weight. Lacking any other pattern for the mental operations of others we use what we have, the ostensibly orphaned model of ourselves. Which is how we get a situation where public accusations against others are essentially confessions of their own crimes. Asking “what would I do if I were in such situation” and then assuming that other people will act the same way certainly is reasonable. That’s the simplest way how a human can try to predict other people’s behaviour. However, people are also capable of going beyond that and understanding that other people differ from them, that they think differently, act differently, and have other priorities. People with major issues tend to think about mental health more frequently and this naturally tends to draw them to study the problem. Oh well, this one is actually true about me. The only reason why I have read psychology books was my suspicion that there might be something weird going on with the way how my brain works. I also wanted to understand how exactly my thinking patterns differ from those of other people. Simultaneously, understanding that my brain works somewhat differently is also the main reason why I expect other people to behave differently than I would. For example, my ability to feel emotions is limited, thus my actions are rarely influenced by emotions. Yet I’m aware that this isn’t the same also for other people, hence I expect their actions to be more heavily influenced by what they feel. The current Republican strategy can be called projection, but I do not for one second believe that the accusers themselves believe their accusations, except perhaps in part. For instance, isolated examples of individual voter fraud surely exist, but not the massive amounts that accusers claim. Only in the current political atmosphere have I found that when a political or pundit makes an unfounded accusation, their side turns out to be doing the same or similar thing. (Aside from what everybody does, OC.) Why that tactic seems to work is not clear to me. As for the Democrats’ long history of voter suppression, it is both longer and harsher than that of the Republicans. Murder was one of the Democrats’ main tactics in the 19th century and into the 20th century. Modern day Republicans are not as bad, although murders have occurred. But there is a continuity between earlier Democrats and modern Republicans, as a result of the Republicans’ infamous Southern strategy. The change has occurred within the last half century. We are talking about the same people or their descendants. Out of breath, perhaps, from dragging a heavy set of ball and chains around all day. Regarding the discussion around Kestrel’s grandmother’s sayings, I’d agree with Ieva: Context matters a lot. Sadly if you started adding bits those lovely expressions would be a lot less catchy. Oh well, this one is actually true about me. The only reason why I have read psychology books was my suspicion that there might be something weird going on with the way how my brain works. I’ve taken the lazy path by assuming all brains are weird and we can’t really tell. [xkcd] It doesn’t really help much but at least avoids the temptation of diagnosing myself with anything, or many things, something I suspect I’d be very prone to do. Really the weird bit seems to be how so many different brains tend to converge on the same modes of thinking – so we can predict each other at all. Given how malleable our brains are supposed to be there ought to be a huge number of methods that can be adopted to approach a cognitive problem and hence different results depending on the path taken. Thinking “out of the box” shouldn’t be the exception, it should be exceptionally hard not to do. I’m not trying to diagnose myself with anything. When I was a child, I managed to appear normal enough so that at school nobody tried to shuffle me into a locked up room with a mental health professional. Thus I avoided any diagnoses. Yay! Lucky me; apparently I’m normal enough. The thing is, I don’t care to find out whether I correspond so any specific set of criteria that could give me some diagnosis. Finding out whether I’m weird enough to warrant giving me a diagnosis is irrelevant for me; my interest was a very different one—I had observed that occasionally other people behave in ways that are alien and incomprehensible for me. I wanted to figure out what was going on and why other people did and felt things I couldn’t experience. A trivial example: about two weeks ago our family’s dog almost died, because she couldn’t breathe when a piece of chicken bone got stuck in her throat. When our dog stopped breathing, my mother started panicking; she was crying, speaking and acting incoherently. I, on the other hand, was as calm as ever. I couldn’t feel a damn thing even when it seemed like our dog was dying (or, possibly, had already died). Logically I knew that I didn’t want this dog to die. It’s not like I didn’t care, I cared. It’s just that I didn’t feel any emotions at that moment. We managed to pull out the bone and free her throat. Even though the dog was unconscious for at least a minute, her heart hadn’t stopped beating yet, so she started breathing again once her throat was free. She survived. In past these kinds of occurrences used to puzzle me: why are other people showing signs of panic, why are they crying, why can’t they remain just as calm as me? Now I know better—there simply are some differences in how our brains work.